The Vision Board tool is a way to have fun, relax, build reality into your dreams and goals, and grow your brain at the same time. 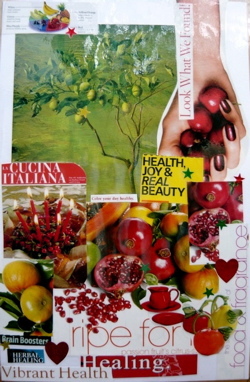 A Vision Board for health focuses on feeling healthy. What images mean "health and vitality" to you? and your feelings emerge from your subconscious, where 95% of what we think is buried. This in itself is a huge leap towards better health, as you relieve stress and become more relaxed. Simultaneously, your dendrites, the nerves that connect to your brain cells, are growing and promoting more brain plasticity. A Vision Board is an excellent tool to use in high-stressed times: Either to make one or to use the one you have to lift your spirits. Sooner or later you will find it useful. I recently had that opportunity. Have you ever turned on your computer and …Nothing! Nada! Zero! I make my living as an editor and use my computer for at least 6 hours daily. I call my computer expert in a panic, and he appears at 10:00 a.m. Many calls to his supervisors around the country throughout the day, with no solution. He tells me he’ll stay until the situation is resolved. Five minutes before he leaves, after eight and one-half hours, my computer expert discovers an animal has chewed through my computer cable. I have not been able to work for eight and one-half hours. 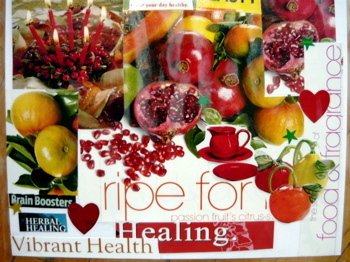 Close-up of the Health Vision board, top half. Colors, textures and words that appeal all work to inspire you. I choose not to stress about the situation when I understand he is not going to be able to fix it immediately. Now, what to do to relieve my anxiety? I feel that anxious buzz in my stomach, and my conscious mind warns me that negative stress is one of the major factors that influences your health and accelerates the march to a fatal disease. I am determined to turn the stress into positive stress, that promotes action and creative problem solving. A vision board will be just the thing to change my energy. I retrieve my vision board materials, a large foam board, and write a vision statement. Today I focus on health but also plan a second one for my work. My business desire projects a major client and cash flow increase, based on the quality of editing and vision board workshop services I offer. When the results make you happy, it's working for you. By the time the computer guy leaves, after 8 hours, my Health vision statement and a large vision board are complete. invigorated, and satisfied with its rich and meaningful, personal quality. My self-expression has promoted a feeling of well-being. The creative act has encouraged my brain cell growth, as it has increased the plasticity of the dendrites, the nerve endings that connect to the cells in my Amygdala, a ganglion of the limbic system that adjoins the temporal lobe of the brain, and manages emotions and creativity. The brain is plastic, and can actually continue to grow, no matter your age. I am truly inspired to see that my innermost feelings have surfaced with clarity and resonance. My vision board process has inspired me to understand a new approach to my present business goals, creative concepts that I have brought to light from the depth of my subconscious. I’ve forgotten my computer failure for the moment, and soared into that creative space where time doesn’t exist. I remember that ninety-percent of all our thoughts are buried in our subconscious, and unless we reach them through intention, these thoughts and desires stay dormant all of our lives, except when they appear as dreams or in unusual circumstances such as neurosis or physical illnesses. 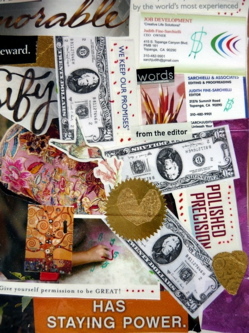 The Vision Board is a map to our creativity and a tool to unleash the inner colors of our subconscious mind. Best of all, I feel energized and renewed! The very next day, I build my business Vision Board. By the end of the day, potential clients call, my Life starts to flow again, and I am reassured again that this miraculous Vision Board process has worked it’s magic through The Law of Attraction as well as it always does. Use images that spark your imagination and delight you. An author with whom my skills and talents are an ideal match calls to ask me to edit her book. Other opportunities begin to flow in on a daily basis, and I feel so healthy and grateful that the Universe has again provided me with this magnificent tool that enhances my life and the lives of others with such powerful grace. I help my clients find the treasure of their inner colors with different approaches and techniques. because it is so immediate and powerful. My physical, mental, and spiritual health is essential to my success in all areas of life, and I support my Life process with Vision Boards as I focus on different challenges. We all visualize or vision when we dream, wish, or desire something or someone. When we imagine, our brain creates possibilities that are destined to manifest, even though it may not always be in the time frame, form, or ways we understand at the moment. The creative process actually grows our neurons’ endings (dendrites), and helps the brain grow in order to make new neural connections. In fact, the brain’s exists specifically to empower humans on every level: physical, mental, and spiritual. Lower section of the Business Vision Board. 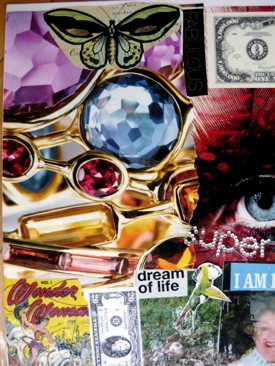 A large vision board works quickly on the subconscious. If you find more or better pictures, glue them on. Think of it as a work in progress. The brain is compelled to grow, no matter what. If it is frustrated in its progress, disease eventually sets in, due to the lack of healthy stimulus and the excess of cortisol, the hormone produced when we are stressed. We need to learn how to feed and nourish the brain with our creativity, dreams, and a healthy lifestyle, so that it will express itself at its highest level. Visioning keeps our physical, mental, and spiritual health and memories alive and fresh, and our ability to think healthy and strong. When we focus on a new task which stimulates our brain, such as learning a new language, a musical instrument, meeting and getting to know a new friend, starting a new sport or hobby, we encourage our brain cells to move from the intangible energy (chi) which is our life force, into manifestation. Our visions and desires manifest when nurtured consistently, because of the Law of Attraction. When we are relaxed and engaged in doing something with joy, we attract the same energy. The visioning process illuminates goals and values that are deep in the subconscious, and helps us re-consider what we want and don’t want. Imagine this: You're walking on a small path through an Aspen grove during an Indian Summer. There is a stream that runs beside the path, and you see the flashes of silver reflected from the trout, which gleam in the warm sunlight. The fresh mountain breeze caresses your face, and the Aspen leaves glimmer gold sparkles against the cloudless blue sky. You see an eagle’s nest, and hawks that cruise the airwaves above your head. Feel marvelous? That quick mental picture just improved your brain function and health. Anytime is the very best time to do a Vision Board and vision statement. Pick a time when you have something you want to clarify: a problem, conflict, lack of clarity or a dark mood. A vision statement or Vision Board is always a positive action that moves you into another place emotionally and physically. Clear your mind to free and boost your imagination with meditation, relaxation and breathing techniques. Collect the images you have gathered about health or wealth: magazines from your doctor or dentist’s office, the recycled magazines from your neighborhood newsstand, photographs, postcards, fabric, and everything that has images that call to you. Use a large, flat, accessible surface so you can spread all your images out. Stay out of the wind or anything that will blow your materials away. Put on your favorite music, one that matches the mood you want to have or create. Use aromatherapy if it relaxes you. Write a vision statement to help you focus on how you want health or wealth to manifest in your future: mental and physical health, love, money, relationships, career, a puppy dog, or anything at all. Focus on nutrition plans, nutritious and colorful foods..
Or--go through the magazines and other images quickly and choose the healthy or wealthy images that appeal. Do not think or focus on anything but the image, words, and colors. Spontaneity is key, as it makes it easier to bring the vision’s images up from your subconscious. Both techniques work. Visioning is a powerful and multifaceted tool to understand and explore yourself, increase your mental and physical health, realize your dreams, raise consciousness, inspire yourself to make your self inspirational to others, reinforce your positive images, attract the larger vision, plan, and focus. This amazing process enables you to reinforce your vision consistently with affirmations, envision your dreams, goals, and unexplored possibilities, rather than dwell in your past, and move into manifestation. Unleash your creativity and inner colors through vision boards, and bring all levels of health and wealth and your heart’s desires into your Life. Judith Fine-Sarchielli is a professional businesswoman who uses her art, writing, and travel experiences to enhance her own life force and to support others in their personal lives and careers. Judith’s ultimate goal and service is to share her creative riches with the world. She helps her clients find the treasure of their inner colors with different approaches and techniques. “Envisioning" or using a Vision Board is a favorite method, because it is so immediate and powerful.” Contact Judith at www. topangatuscanyandbeyond.com for reprint rights. (c) all rights reserved. 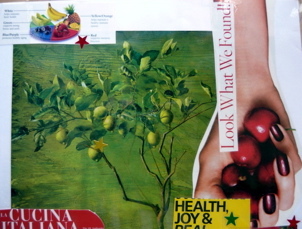 A Billboard Style Vision Board or treasure map can be done in many styles. All work to imprint your subconscious mind. Consider how effective advertising is to compel action - and use the same methods yourself. It's fun and you'll be surprised at the ideas that surface. Find your Inspiration in just this way. See why it is hard to stick to a diet or to make money or improve relationships. Old excuses stick you to old habits. Get the truth - make changes easily and quickly. Use your Attracting power to create the life you want. Is an Internet business right for you? Research it free and see how others do it. Successful sites easily earn $2,000-$5,000 a month - learn how they do it. Spend some time researching and you'll discover all you need to know - and see it working with proof you can test. Once you understand how a Web business works you'll see why so many fail. Your talents and hobbies can become a successful home business - when you follow a proven plan. Take the video tour today!